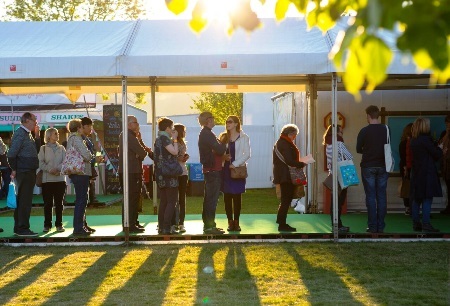 The Hay Festival has announced its 30th birthday programme. Stars at the festival, taking place from 25 May to 4 June, will include Colm Toíbín, Peter Singer, Neil Gaiman, Elif Shafak, Bernie Sanders, Nemat Shafik, Tracey Emin, Stephen Fry, Michael Sheen, Brian May, Graham Norton, Elizabeth Strout, Eddie Izzard, Jeanette Winterson, Howard Jacobson, Yanis Varoufakis, Paul Beatty, Carlo Rovelli, Jacqueline Wilson, Judith Kerr, and Chris Riddell. A number of events will take place under the banner of 30 Reformations, which challenges speakers to "re-imagine institutions and orthodoxies, from capitalism to the NHS, from marriage to citizenship". Hay 30 will focus on young novelists, scientists, philosophers and activists. The BBC will host a series of events, live radio broadcasts and recordings of shows. The Hay on Earth Forum on Thursday 25 May showcases entrepreneurs who have found and are developing innovative ways of solving problems in transport, growing food and using waste; participants include Jonathon Porritt, Lucy Siegle and George Monbiot.